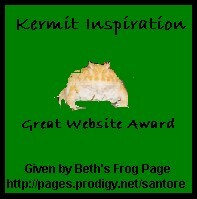 Here is our growing awards for our efforts at the Kermit Inspiration Site. We are proud of our Awards! Thanks for supporting us! Invite Kermit The Frog into your life! See Kermit The Frog in action!